Most notable findings from the risk/needs assessments indicated that 81.2% of the juveniles had school behavior problems, combined with 57.3% indicating a need for mental health care, 26.6% substance abuse problems, and 57.6% had negative peer relationships. Males, blacks, and juveniles aged 13-14 had higher recidivism rates, as did those with higher risk or needs scores. Recidivism was lower when the response of the juvenile justice system was less invasive, either by processing and intervening with youths short of adjudication or, if adjudicated, providing disposition short of the most restrictive option of confinement. The study concluded that the most efficient use of resources is in the community, at the front-end of the juvenile justice system. The majority of juveniles in the system benefit from rehabilitative resources of a less restrictive nature. Juvenile defenders may influence their client’s ability to benefit from these findings by being familiar with community resources as well as asking about your client’s likes, dislikes, favorite activities, and home situation. Even if your client’s matter wasn’t diverted by the court counselor, presenting alternatives and favorable facts to the prosecutor may result in a diversion for your client – and potentially a lower risk that s/he will end up moving deeper into the juvenile court or adult system. 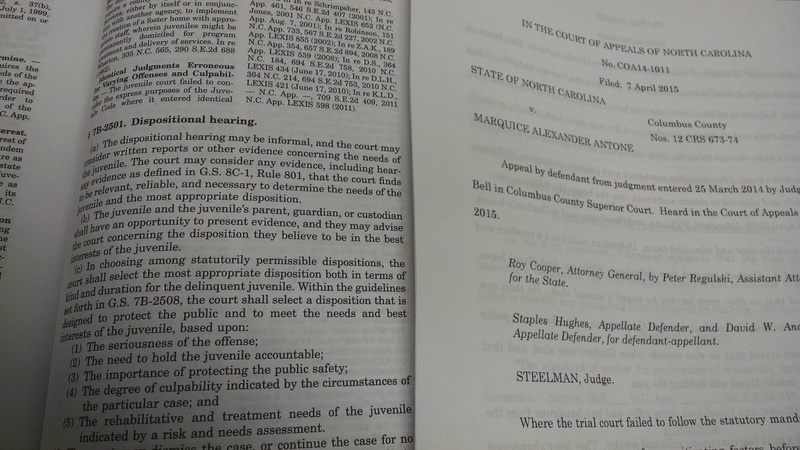 You can find the complete report here: NC Sentencing and Policy Advisory Commission Juvenile Recidivism Study: FY 2010/11 Juvenile Sample (May 1, 2015). From the “On the Civil Side Blog,” please see this important blog by Professor LaToya Powell. Professor Powell does a great job breaking down the law and procedure when there is an admission to a lesser included offense, or to a different offense.